Course Objective: Students will learn to use a variety of multimedia creation tools including video cameras, various video editing software and on-line media sources. We will be shooting, editing, adding music and creating our own movies, commercials, videos, etc. using digital media, scanners and still pictures. 1. Project Work /Daily Work and ability to work on projects and class participation. 2. Proficiency in using multimedia tools. 3. 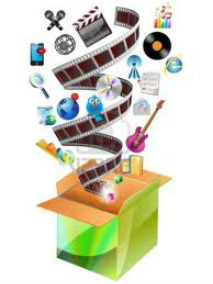 Assessment – the developing of multimedia skills and project work. Sit in their assigned seats and be ready to work when the bell rings. Take care of all personal duties before class. Bring all materials to class each day (headphones, folder, notebook, pencil). Be working on assigned task at all times. Be respectful to teacher and fellow students. Avoid any behavior that keeps another student from learning. Follow all school rules and all instructions given by the teacher. Not be surfing the Internet unless told to find information by the teacher. Turn assignments in with your name on them via the drop box. They need to be exported as a QuickTime format prior to turning in. Adequate time needs to be allowed for this. Use your time wisely. Assignments without names will be trashed without opening. Be sure to drop the right file into the drop box and check to make sure it is there and works. Close any documents before dragging them to the drop box. Assignments not dropped in this manner will not appear. Be sure to check drop box for your assignment. Delete completed and handed in assignments/projects from your server when you start a new project. If this procedure is not followed all projects in your server may end up deleted by the server as you are only allowed one project at a time and only for this course. Be respectful of other classes by being quiet in hallways while videotaping, respecting others, etc. Remain in your assigned area until you are excused. There may be daily points for being in class and on-task. These points cannot be made up. Follow the rules and we will have a great learning experience. Attendance: If the student is in class everyday and stays on task there should be very little, if any, homework. If the student misses class for any reason, he/she needs to make that time up during AP or after school to stay on track. It is vital that students are in the classroom every day. Any class periods missed will need to be made up on the student’s own time within 1 day immediately following the absence. For example, if you are absent Wednesday, you will have Thursday to make up the work. If you are present Tuesday and it is announced there is an assignment, quiz, or test due Thursday, you must turn in the assignment, quiz or test on Thursday even if you missed class Wednesday. Students may make up work during AP or after school. Students are only allowed in the computer lab during Open Lab or after school with teacher approval. Work that is not made up within the 1-day period immediately following the absence will result in a zero. I do not accept late work. In the event of an absence, it is the student’s responsibility to find out what work was missed and to make-up work when they return. It is essential you are in school – computer classes are very hard to “catch up” with, especially if you are working in a group. Classroom Rules/Expectations: Rules are intended to provide each student with the best opportunity to learn in the classroom environment. I have expectations for all students to learn, participate, and provide a positive classroom environment. The No’s: No food or drinks, candy, sleeping, degrading of others, games or random internet searching.